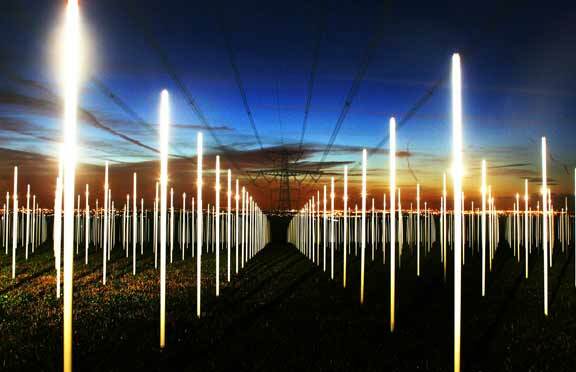 Artist Richard Box of Bristol University in Bristol, England put several hundred fluorescent light tubes in the ground under some high tension wires in a field east of Bath, England. In the daylight, it looks like nothing is happening, but when it gets dark, it is clear that all of the tubes are glowing as a result of the "waste emission" coming from the overhead wires. You might also want to check out Return of the Dragon Hazards of Man Made Magnetism. This is the best evidence of what this kind of energy might be doing to those who live under or even near such sources of electricity! This man-made pathogen is called "Technopathic Stress." It can be caused by a number of man-made (technological) factors that can include air quality (including such things as mould spores, improperly stored cleaning agents, asbestos, and radon - a naturally occurring gas that can permeate a house, but is especially nasty in cellars); light quality (including Seasonal Affective DIsorder, or SAD); Sound Quality (noise); Electromagnetic Fields (as seen in the photo above, and present in high tension wires, building wiring, TV's and computer monitors and broadband wireless phones); and Geological Factors (fault lines, underground caverns and mines, and mineral seams). This is not a comprehensive list of sources of technopathic stress, but it will give you an idea of the kinds of things that can be found in a home that are deleterious to a person's health other than geopathic stress caused by various Earth energies and other more spiritual factors. There is growing evidence of a connection between cell phones and Wi-Fi and physical disease. Pne hint of this is that there has recently been a dramatic increase in testicular cancer among young adult men. And where do many of them carry their cell phones? But even more disturbing is the connection between brain cancer in the use of cell phones by young children that is discussed in - Cell Phone Dangers - What They Don't Want You to See. While there is a growing mass of evidence that technopathic stress not only contributes to physical dis-ease, butfrom a sacred geomancer's point of view there is also another real issue with the use of electromagnetic energy generators like cell phones and Wi-Fi. ANd this is on the spiritual level. Dr. Manfred Doepp of the German Society for Energy and Information Medicine has spoken in a recent interview entitled Mobile Phone Radiation: Switching of the Brain about his concern that using a cell phone switches off right brain function, so while one's analytical left-brain skills remain intact, there is no heart, no intuition. This is of especial concern here in Glastonbury which has recently become the first free Wi-Fi town in SouthWest England. If indeed Dr. Doepp's suspicions are true, is it possible that this new electromagnetic storm here in the Land of Avalon might actually inhibits pilgrims' ability to to connect with the Spiritual? Most of the time, Technopathic Stress can be found by using man made hand-held machines. A full list of websites that have further information and ones that sell various tools for measuring these man-made and natural energies (like radon and fault lines) can be found in the Links Page of this site.